‘m getting ready to record a new album this summer. The last one was finished 6 years ago, so there’s a lot of water under the bridge. I write most of my songs in a moleskin journal I keep by my bed. I keep thinking inspiration will hit during sleep, and I’ll need to have the journal handy to scribble the download. I’m still waiting for the first occurrence. I’ve tried writing songs on my macbook, which would be a really good idea, because my handwriting is truly an embarrassment. But, there seems to be some kind of connection for me between inspiration and writing with my own left hand. I’ve used quite a few notebooks and written hundreds of songs. The vast majority aren’t worth recording or playing in public. I’m pretty sure my notebooks aren’t going to be worth much when i’m gone, except to people who know me. I like to go back and look through them sometimes though, because one story line I see going through all the songs is a longing for genuine expression of what’s on my heart. When I was young it was about wanting to find love. Later it was about the joy of finding love. 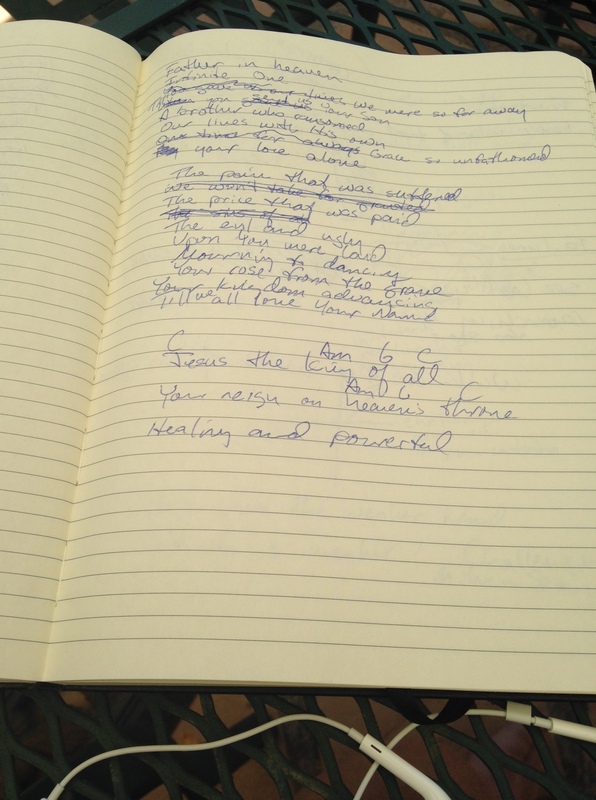 Then I wrote about what I thought about God. Later, I started writing to God on a personal level. This led to songs for the church to sing as acts of corporate worship. In the last few years, I’ve written anthems, laments, songs of thanks and songs of reflection. All of them focused on helping God’s people come into his presence with open hearts. As a songwriter and worship leader, I find great joy in being able to write songs that represent the heart of God’s people for him and the heart of God towards his people. If you write songs, i encourage you to keep doing it, with increasing frequency. Don’t be afraid of having unfinished songs in your book. One of my songs took 15 years to finish! The more you practice writing, the more you’ll experience inspiration. The more you spend time in His presence, the more you’ll recognize God’s voice. Songwriting isn’t magic. There’s inspiration involved to be sure, but there’s also the willingness to just step out and do it. Write!